A valid epub ebook which passes epubcheck will already contain a logical table of contents. This is a file called ‘toc.ncx’. (I will link to a future post on how Sigil generates this here.) You will find this in the OEBPS folder. (See here to understand the structure of the OEBPS.) It will already be correctly linked in the <manifest> and <spine> sections of the content.opf file. You don’t need to do anything to these entries. Kindle will, however, ignore the ncx table of contents, even though the Kindle needs the file. You should have created a chapter near the front of the e-book containing hyperlinks to the various other chapters and perhaps sections within chapters. This is the html table of contents. There are important details about the way the hyperlinks are coded for them to work properly in Kindle ebooks, and I have devoted an entire post to how to do this. (Click here to read this post.) Once the links in the html table of contents have been restructured for Kindle, you need to link the html table of contents to the ‘table of contents’ button on the Kindle. 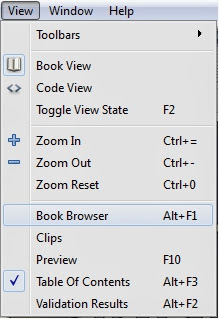 If you do not do this the button will be greyed-out and the reader will not be able to use the button to jump to the table of contents.